This is a group shot of everybody in CAP 2-7-2 from December of 1970. 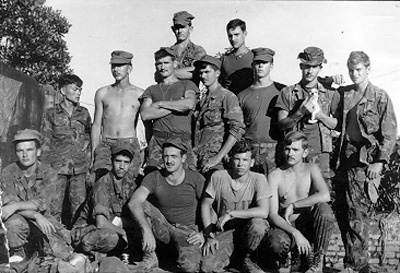 This photo was taken after the photo on the home page taken at the “Kitchen.” This photo is unusual because it shows the CAP at full strength, with 14 Marines. Our typical strength was 12 and once we were down to eight. “R.J.” Carrier is wearing an official issue “jungle” hat with a cut-down brim, but jungle hats were hard to get. Everyone else is wearing a standard issue Marine utility cap.</p. (Back row L-R) Dennis “Hucklebuck” Prock, Grovespring, Mo. ; Steve “Frenchy” Pelletier, New Jersey; (Second row L-R) Gia, our Kit Carson Scout; Sgt. David Lane, Oklahoma; Casey “Country” Roach, California; Glenn Trimble, Arp, Texas; Roch Thornton, Winfield, Kan.; R.J. “Motown” Carrier, Sterling Heights, Mich., (with our puppy “Pigpen”); Nelson Kilmister, Portsmouth, N.H.; (Front row L-R) Steve Maynor, Illinois; Paul “Tex” Hernandez, Brady, Texas; “Scotty” Shirley, Birmingham, Ala.; Rick “Doc” Doggett, Wenatchee, Wash.; Ken “Dunc” Duncan, Crystal City, Mo.